I'm a little late with this post (thanks holiday hustle and bustle), but on December 5th we attended the winter Steel City Con in Monroeville, PA. I don't think there has ever been a Steel City convention that we have missed in the last few years and they just keep getting better and better guests. However, along with those better guests, comes egos so huge they fill a room and prices so high you could sky dive off of them. In April when we attended, ticket prices were at $15 per person for one day. That was an incredible price. August came and prices went up to $20. No big deal, as we figured this was because of the better guests that had been booked. It was only a $5 increase after all. In the months before this most recent one, the internet blew up with so much unfortunate information about this convention, which use to be one of our favorites, that made us question if we were going to have to stop going. The first big announcement was that ticket prices were being raised once again. This time to $30 per person. It's still on the low end when compared to Wizard World, but the fact that it had increased so much in such a short amount of time was a bit irritating to those who frequent this convention. The next bit of information didn't come from the convention promoters at all, but the vendors that set up tables there. It had come to the attention of the guests that the organizers had changed the contracts or terms after many vendors had already signed up. One huge problem was that the vendors now had to pay for their seating and were not allowed to bring their own chairs. That wouldn't be so bad, I guess if they didn't have to pay $10 per chair on top of their table price AND price for electricity to be run to their booths if it's needed. They also have to pay for an extra pass for a guest to help them run their booth, it's not included in the package price of their spot on the convention floor. many vendors were backing out and it was no surprise as horror stories from artists and merchandise sellers arose about the way they had been treated by the organizer of this convention. One such artist was THREATENED by the organizer for using the Steel City logo to promote that he would be attending. That seems pretty petty and ridiculous since this artist was giving the convention free publicity. Still, the con was packed full and it didn't seem to me like they were hurting for business despite the fact that vendors were whispering back and forth about what had unraveled in the weeks before. Naturally, when I got there, the first thing I did was go snuggle Tom Savini! I've pretty much made this a con tradition. This particular convention was a rough one for me, with Josh's passing just a few short days prior to the convention. Conventions remind me of Josh because that's how we met and became the best of friends, and Tom and Josh were very good friends as well. Josh even took Steve (from Ghost Hunters) to Tom's house once. I'm glad that this was the first table I went to as soon as I got inside. a hug from Tom was all I needed to cheer me up and start to enjoy the convention. 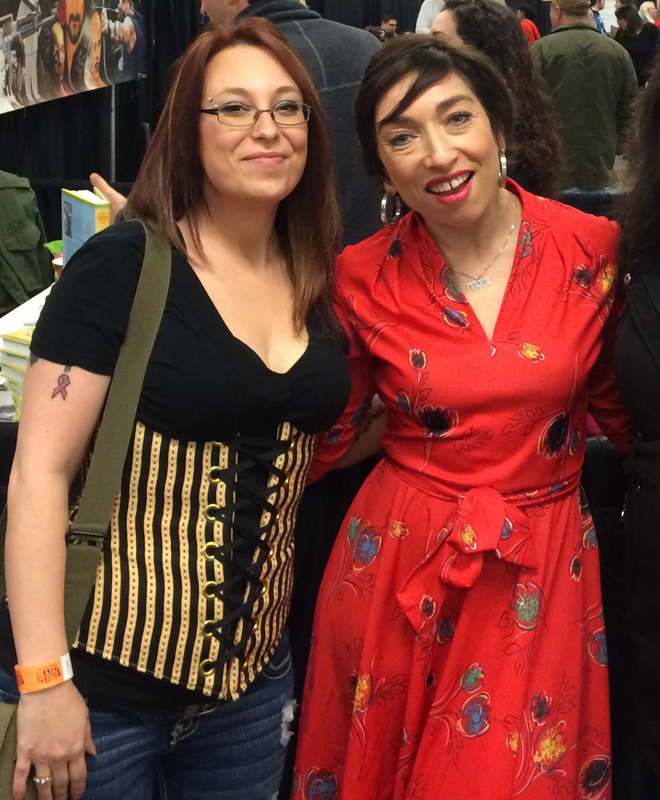 We then went to meet Naomi Grossman, who played the role of Pepper in two seasons of American Horror Story. She was an absolute doll! She's so sweet and she signed my Pepper Pop Vinyl. 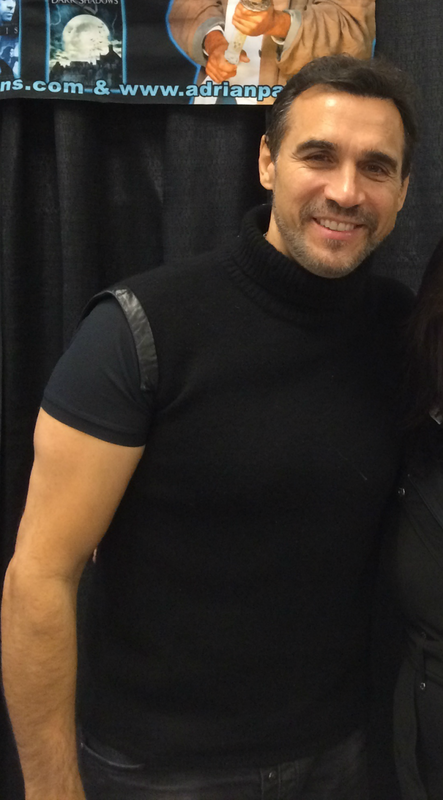 My aunt got in the photo with me, but I cropped her out for privacy reasons (her's, not mine, obviously). It was her first convention and Naomi was her first celebrity meeting. Another celebrity guest that I was super excited to meet was Jason Mewes, who is mostly popular for being in many Kevin Smith movies, but he's been in a ton of other shows and movies as well. Meeting Jason has been on my husband and I's bucket list for 10 years. We've managed to meet a lot of Kevin Smith's friends and we are hoping to someday be able to meet the man himself. Jason went a little crazy with my camera. I think he took 16 selfies total. Had we known he was going to take so many, we would have definitely posed differently in them. You can see by the look on my husband's face that he went from a normal photo smile to almost full on laughing because Jason just kept taking selfies. He signed our Clerks 10th Anniversary set (which is now our second signature on that set), and was a ton of fun to meet. One of the things my aunt wanted to do while at the convention was to meet Adrian Paul of Highlander. Once we got there, though, she kind of clammed up and got shy about it. My husband and I slowly talked her into getting into his line to meet him and you can't see it here, but the smile on her face when she met him was priceless. After she met him she had a "celeb fever" which is what happens when you meet your first celebrity at a convention. You shake uncontrollably, your heart almost beats out of your chest, and you can barely speak in complete sentences. Yep, she definitely had a "celeb fever". Surprisingly enough, I realized at this convention that my celeb fever had actually turned into a con high. You would think that after all these years, meeting celebs would be easier for me, but I still get shy and as my husband calls me a "babbling idiot". This time, however, I confidently walked up to the tables, smiled big, and started talking to the person behind the table like I had known them for years. I almost kind of miss celeb fever, but the con high was just as awesome. We're already planning our next trip to Steel City Con in April and I'm stoked to meet Tony Todd and get Julie Benz' (who's actually from Pittsburgh!!) signature on my Dexter box set. I am also considering the purchase of the 90210 complete series so I have something for Shannen Doherty to sign as well! You can see the current list of guests slated to appear, below, but this is not a complete list. They have been known to add many more as it gets closer and closer to the weekend of the convention.